The Rolex Experience at new Rolex Boutique in Shanghai, Bund 27, is a combination of museum, educational presentation and interactive playground, all designed to educate the end consumer about what is considered the most widely-known brand in the world. It’s designed to take you from the Pulse of Rolex (a changeable exhibition area) right into its heart, leading you into a Rolex watch-like gallery space made up of interactive exhibits and historical presentations, all designed to educate and amaze you with the accomplishments of the Rolex brand. You enter the Heart of Rolex through a door that is shaped like the winding crown of a Rolex watch. The presentation is broken up into five points of the famous Rolex crown, which are the five pillars of the company. Go to www.TheRolexExperience.com and see the video online at Rolex website!! VERY cool!! The site, called The Rolex Experience ( www.TheRolexExperience.com )has been designed to share the company’s history, quality, and expertise in three different stages through an engaging and interactive experience. The first stage allows visitors to explore the brand’s universe through six different stations: Heritage, Four Sites for Perfection, The Oyster, Performance, Partnerships, and lastly The Rolex Institute, which represents the brand’s philanthropic or otherwise non-commercial endeavors. The stations engage viewers with high-end technology like 330-degree panoramic film, plasma screens, directional speakers, 3D animations, and an infrared system for navigating menus. This interactive tour highlights the innovations, milestones, and partnerships that have cemented Rolex’s place as a leader in consumer luxury. With the history under their belts, the second stage is a dynamic and evolving space that showcases temporary themed exhibits. Here, Rolex will also host celebrities from culture and entertainment, Rolex’s clients and partners, and provide exclusive presentations of the brand’s most recent models, including the latest Rolex models from BaselWorld 2011 that are currently on display. This final stage of The Rolex Experience is designed to create a lasting impression on visitors. The Gallery is an intimate salon drenched in soft light where guests can marvel at 200 exceptional timepieces. The lighting displays the watches, which are grouped according to their specific functions and universes, to the best effects, setting off the diamonds, precious stones, and sleek finishes that characterize them. Rolex hopes this retail experience will kickstart a greater brand affinity for Rolex in China.In recent years, Rolex’s global retail growth strategy has not been particularly clear; regardless, one thing is certain: success in emerging markets is very important to the company. Of course, China is on the top of the list…. –> Honestly, its still a miraquel to me why Rolex is NOT using their most important hero’s from their past, Sir Edmund Hillary & Jacques Piccard?!? 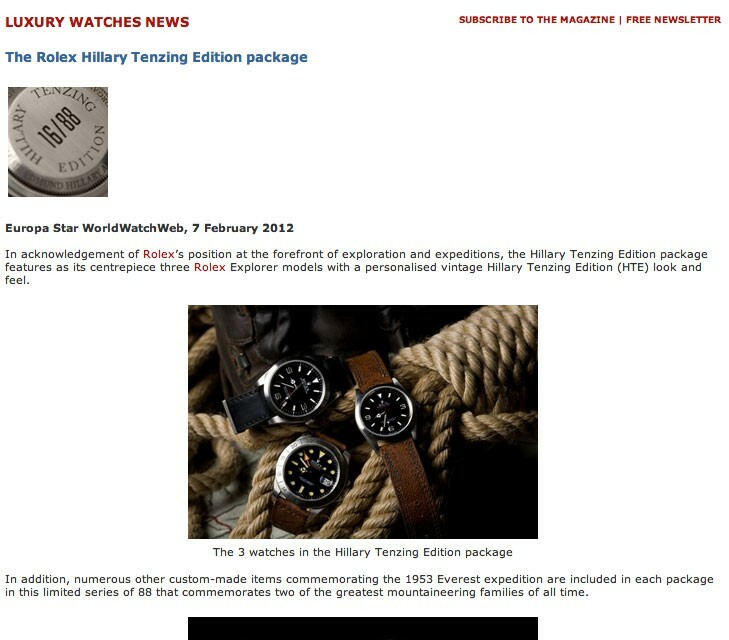 7 Februari 2012 – NEWS – The Rolex Hillary Tenzing Edition package. When i read it, it’s like Rolex themselves are doing my project ?!? 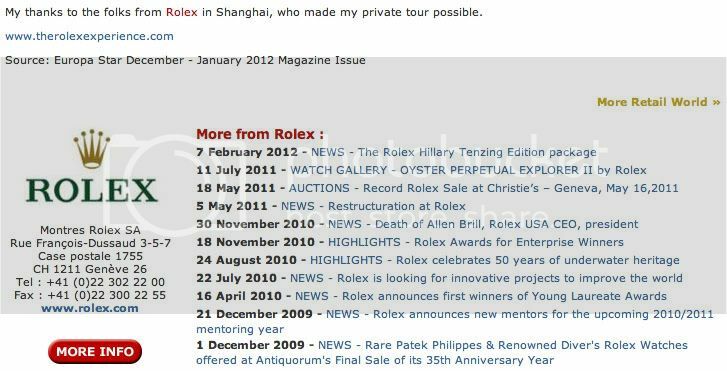 got the dates wrong for passion hk too ;-( see you yourself..
We never have our registered brand affiliated with Rolex! When journalist mess up again, nothing I can do! I think Rolex missed a golden opportunity to show us their Heritage because NO vintage Rolex is on display in their ‘Experience” !?! Can somebody explain me how it’s possible to “share the company’s history, quality, and expertise in three different stages through an engaging and interactive experience.” WITHOUT displaying their Heritage ?!? It’s like a swimming pool without water, car without engine, watch without soul,. Sorry, I still don’t get it! This post was written by Philipp on February 11, 2012.